The Northview team is highly qualified to deliver the future. We have expertise in weather forecasting and modeling, big data science, wind energy, and software development along with extensive industry relationships to understand common weather pain points. We are a resourceful and responsive team ready to develop and deliver new technology to bring value to our customers and improve the quality of life for everyone. Jay co-founded Northview with a passion to help others see the future through his eyes – to help them get smarter about weather. 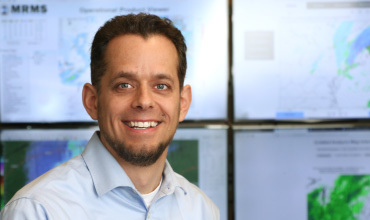 As an accomplished weather forecaster, Jay is passionate about inventing new technology that better connects weather risks to high-stakes storm planning decisions. Jay is also deeply interested in developing weather forecasting technology that accelerates the penetration of renewable energy. With broad experience in private sector weather applications in energy and transportation, he has observed that too often the skill of weather forecasting exceeds the sophistication of organizational intelligence to fully utilize its value. Weather has always been central to Jay, from making his own snow plows as a kid to forecasting the impacts from nor’easters on the electric grid. Jay is also a Professor at Northern Vermont University-Lyndon (formally Lyndon State College) where he teaches the art and science of weather forecasting. Jay’s expertise is in mountain weather and winter weather. His students have attended over 25 graduate schools, worked in over 30 media markets, and have been employed at over 25 companies. Jay may be found in Vermont’s beautiful Northeast Kingdom playing with his two children, growing garlic, running, or helping a neighbor with his tractor. David is a New Jersey native who grew up fascinated by big east coast snowstorms. He remembers the blizzard of 1996, which brought nearly 3 feet of snow, as the reason why he chose to pursue a career in meteorology. After graduating high school, David moved to Laramie, Wyoming to attend the University of Wyoming, where he obtained a B.S. in Earth System Science and a M.S. in Atmospheric Science. 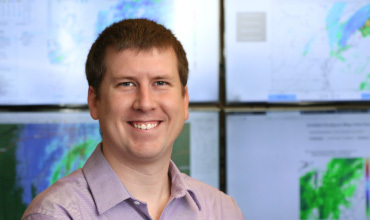 For his Master’s research, David began working with the Weather Research and Forecasting (WRF) model to predict wind speeds in support of wind resource assessment for clean energy. While attending Wyoming, David developed an interest in boundary-layer and mountain meteorology processes, and how they affect wind forecasts. From Wyoming, David took his interests in boundary-layer and mountain meteorology to the University of British Columbia, where he worked under Prof. Roland Stull and the Weather Forecast Research Team (WFRT). David developed expertise in numerical weather prediction during his PhD, including ensemble and probabilistic forecast methods for winds in mountainous terrain. David maintained the WFRT’s operational ensemble forecast system and successfully pioneered efforts in running the WFRT’s weather forecast models using cloud computing resources in real time. David is responsible for developing and running Northview’s ensemble forecast system and maintaining Northview’s cloud-computing resources. In his free time, David enjoys taking trips to Colorado for mountain climbing and hiking, and exploring Vermont’s Green Mountains. Alex gained an early passion for meteorology while growing up along coastal Maine, which led him to pursue a career in atmospheric sciences. After staying in New England for his undergraduate education at Lyndon State College (now NVU-Lyndon), Alex moved west to complete his PhD at the University of Utah. During his time in Utah, he gained interests in instrumentation, fire weather, and air quality research. This included the development of web visualization products to support field operations during the 2015 Great Salt Lake Summer Ozone Study. Alex continues his Postdoctoral research with the University of Utah developing and supporting air quality and mesonet visualization software. Alex also serves as the development coordinator for Synoptic Data, a company founded from of the University of Utah-based MesoWest project. Alex creates processes to ingest real-time mesonet data streams so data can be disseminated to the National Weather Service, educational institutions, and the general public. Alex contributes to Northview through the development of web-based interactive graphical and tabular products to better communicate weather risk. Alex is an avid sports fan, with the Boston Red Sox, New England Patriots, and Utah Utes being his favorite teams to follow.